This will be a very short post, in fact, one which was requested by one of our friends. In this post we will learn how to move a GameObject (which of course, can be extended to any Player / Character) to a touched position on a touch screen device or a clicked position of the mouse on a non-touch device. This will be mostly used in Role-Playing Games (RPG), wherein we tap on the screen and the Player moves to that position with a constant speed. Of course it's a Unity tutorial, a Unity Byte as we call it. To get started create a New Scene and name it whatever you want to. Add a Terrain to this scene or instead, you could add a Plane, it's left to you. Position it a (0, 0, 0). Add some material to it so that you can get a better picture of it’s. Make sure that this Plane / Terrain that you have created has a Collider component attached to it. Now add a GameObject of any kind, I'm adding a Sphere, because I'm partial to them. Position it at (0, 0.5, 0). 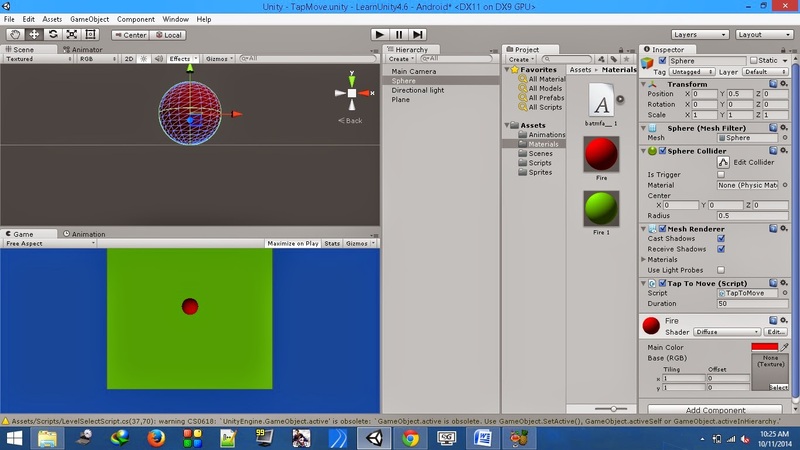 Add a material of a different color to this Sphere. Add a Directional Light to lighten up the scene. Create a new C# script named TapToMove. Attach it to the GameObject you've just created. Save the scene and open the script. //flag to check if the user has tapped / clicked. The script is thoroughly commented and it hardly needs any explanation. However, there is one line which does need some kind of clarity. In the above line of code, we are basically moving the gameobject to the touched / clicked position at a constant speed. The first argument in the Lerp function is the source, second is the destination and third is the amount of time it should take to reach the destination from the source. Greater the duration value, lesser the speed, and vice versa. We have also multiplied the distance between the source and destination to this duration to make sure that the speed remains constant regardless of the distance between the two points. Save the script and return to unity. If you test this your object should move to the touched / clicked position at a constant speed. Thank you! Do you know how to do the same thing in 2D? Should be fairly simple. Just replace Vector3 by Vector2 in the code and also set the scene in 2D mode and add 2D sprites instead of sphere. The scene setup might change a bit, but the code shouldn't change apart from the Vector2 thing.. Thanks for this script, works well on my project, but how do I rotate the object on their y axis when changing heading to make the movement more realistic.? And what about one more object, mean two objects in scene..how to get both objects go to direfent locations? I want to drag the game object where i drag my finger on mobile. This code is moving the game object suddenly. How can i drag it with touch? It worked, but i was not able to put another variable, and manage to control the time for rotation. However i am learning, so i will figure it out eventually. However this gave me a little bug, when i click a lot, the object seems to start its movement from different and seemingly random positions. Can you advice me, way maid this occur? The compiler is popping an error while building: "use of unassigned local variable"
Set your camera tag to main camera. what do you mean by that ?? Hi, how we can apply this to a character with walk animation and rotation ? So thanks its helped to me my MonoGame game project! This is great, but how do I get the character to follow the mouse/finger while still clicking. Right now it will move towards where I click until I let go of the mouse button, but it travels in the same direction even if I move the mouse. How do I get the player character to follow the mouse? Also, I already have wasd movement set up, but I'd like players to have a choice between using the keys/arrows, and click to move. Problem is that you can cheat, and go twice as fast by using both. How do I prevent this? error CS0165: Use of unassigned local variable `hit'. sorry I was missing something. Not working with me, I am using 2d object, and I changed vector3 to vector2 !! what do do with this error ??? Hey Man, Thank you so much! Thanks dear i love you blog. I am struggling with one issue. Please help me out with the script to move camera on terrain with touch and the touch should be restricted to terrain only.